Reality check - videos with 2 key people confirm Griquatown tokens NEVER circulated. I have just returned from my last trip to South Africa. This time I was armed with a video camera and took up the opportunity to interview two of the most important people when it comes to the relevance (or not) of the Griquatown token coins (c1820). Nicholas Waterboer, the Griqua Chief and the direct descendant of the Waterboer chief of Griquatown. 1) Waterboer: the tokens were never circulated they were only ever seen as trinkets by the Griqua. Waterboer knew of a number of the tokens (about six) held by a member of his community back in the late 1970s - the tokens originated from Waterboer in c1820. 2) Hager: In thirty years no local/Griqua has ever come into the museum with a Griquatown token coin. She only ONCE saw the tokens which had been bought by a local farmer from an unnamed Griqua in the early 1980s. ii) the source (a descendant of Waterboer). Note the comment by Hetta Hager that the local farmer who bought them from "the" Griqua took them to Johannesburg in the 1980s and sold them for a lot of money. In Karel Schoeman's book on Griquatown he carries a transcript of a letter in which the resident missionary states that he still has the great majority of the tokens and does not know what to do with them... we now know where the balance went - to the Chief - Waterboer. 1) Not one Griquatown token ever circulated - they were a very brief and failed experiment. 2) They have no relevance to numismatics and are nothing more than silver trinkets. The only missing piece of the puzzle is who was the coin dealer in Johannesburg involved in the transaction? ...and your point is??? ?...so why do they fetch such high prices?? I am delighted you listened to the video.. let me demonstrate to you why your quote above is wrong and so misguided.. The first highlighted question is an open question about the tokens to which Waterboer firmly states that they did NOT circulate. Just to make sure we were on the same page and because I expected a couple of responses like yours I asked him questions to clarify and he did - without prompting. As far as Hetta Hager is concerned the core of this interview is that in over 30 years as Curator of the Mary Moffat Museum in Griquatown not one Griqua living there ever showed her a Griquatown token. Note my opening post in this thread in which I make this point clear. I would be interested to know how I gave her leading questions prompting that answer by her. 2) they had no store in which to trade and lived the most basic of nomadic lifestyles based on barter... but this is all ground I have covered here time and again. In short Waterboer's response to the issue of circulation of the Griquatown tokens makes perfect common sense. I offered any collector, including yourself Pierre, the opportunity to debate me in a public forum on this subject while I was in South Africa. I would suggest that the most telling issue here is that neither you nor anyone else took up the challenge. The answer to your question is that the price of these items (tokens or coins, whatever you care to call them) is a function of collector collecting practices. And the best explanation for why collectors view them the way they do and are likely to continue to do so is because they are included in catalogs like Hern and Krause. This is not uncommon at all. In the United States, coins like the 1792 half disme (Judd-7), 1836 Gorbrecht dollar (Judd-60), 1879 Flowing Hair Stella and 1836 half dollar (Judd-57) have been viewed by some in one way and by others another way over time. The three coins which I have added the Judd reference are now generally viewed as regular circulating coinage to my knowledge which is why they are worth their current prices. The most recent to change is I believe the 1792. As a pattern, it is common. As a regular issue, it is not. I used to think of these coins as patterns but have come to agree with the consensus because these three are not in better grades than others like them and obviously circulated just as much. The 1879 Stella is still classified as a pattern by all but many people include it as part of a type set anyway which is why it sells for the exorbitant price it does. Aside from historical interest, most collectors are not going to care whether the items that are the subject of this discussion are or are not what the catalog say they are. They ARE IN IT and that is all that matters to most. And because they are, most collectors will in this instance include them as part of a full set of South African coinage. From an "official" standpoint, I do not consider these items coins because they were not legal tender to my knowledge. The only items that have legal tender are those either struck by a government (sometimes subjective I admit) or privately under government authorization. I classify these as tokens just as I do every other pre-Union issue that was not struck by the ZAR whether they were used as money or not. The same applies to the pre-Union "pattern" pennies which Hern admits were salesmen tokens. REgardless of what these actually are, the numismatic establishment is not going to change the catalog because they have nothing to gain by admitting a prior error and something to lose. (This is characteristic of academics also.) You can also be sure that those who own or sold these items have no incentive to change their mind either because any such change would likely reduce their value. I agree with just about everything you say John but, most of all, the quote highlighted above. There is something I would like to add. Argumentum Ad-hominem: Shoot the messenger fallacy. This is a common logical fallacy. Argumentum ad hominem basically means that the argument becomes directed towards the individual as opposed towards the crucial issues being discussed. It is succinctly described as, attack the messenger not the message (hence – shoot the messenger). It is often seen in both politics and pseudoscience. Its aim is to undermine the position of ones opponent, by undermining the opponent personally (in a manner that is actually completely irrelevant to the debate). The hope here is that if one can discredit the individual, this by default, discredits his / her argument. It does not. The fallacy here relates to the irrelevance of the attack. It is not viable to argue against a position and then justify that argument by criticising the individual who holds it. Arguing that I do not know what I am talking about because I do not live in South Africa is hardly convincing. (This has been suggested on the BoB thread before). Similarly, a cognitive neuroscientific account of strange experiences (i.e. near-death experiences) is not incorrect simply because the scientist proposing it is a skeptic. These are all examples of the ad-hominem fallacy. Any claim or theory should not be rejected solely on the basis of who holds it. Point three is the twist that follows the shooting of the messenger. It would now be interesting to engage a numismatist of note in debate over the issue - without using this irrelevant strategy tried here on BoB so many times in the past. Gentlemen - please remember the forum rules, no confrontational posts, do not argue with the poster. Personally, I do not see why any collector cares whether these items are or are not what the numismatic establishment claims. That is, unless they own them now or recently sold them to someone who does in which case they are biased. They are what they are and should be identified correctly, regardless of what that happens to be. The same is true of the tokens that you collect that circulated either with or prior to the ZAR coinage. The impression I have is that with at least some of them, you have proposed reclassifying them from tokens to coinage making them essentially equal with ZAR and if that is correct, that is probably what others do not like. If this is also correct, then I think you have your work cut out for you because most tokens do not share the same characteristics as coins which is why they are not recognized as such and correctly are not. Looking at those that you collect that I know, the S&C, none of those look like coins which is why even if they met most or even all of the characteristics, only those who collect them such as you will think of them that way. There is no "rule" that says a coin has to look a certain way or meet a defined set of characteristics but frankly, the Griqua "coins" or coins look a lot more like most others than these do. I will tell you that for this reason, what I stated in my last post and the other characteristics that I believe apply to them, I do not consider them coins either. I agree with you that they circulated as a money substitute but that in and of itself does not make anything a coin. Using the United States again as an example since I am most familiar with it, here are three examples in US numismatics where sometimes issues are classified as coins and sometimes not. In US colonial coinage, those issued prior to the establishment of the US Mint in 1792, some issues were struck under authorization of the colonies and some were not. I do not know the history behind each one. I do not have a colonial coin reference book, but those included in the "Red Book" are the issues classified as coins though a few are also specifically identied as tokens. In US Territorial gold coinage, there are many issues that were neither struck by the US government nor under government authorization (to my knowledge). Only the US Assay Offfice and Augustus Humbert issues were so authorized. Some like the Mormon gold obviously are private though some presumably could claim that they were the functioning government before becoming a territory. But once again, these $5 and $10 gold LOOK like coins. Lastly, there are many tokens which circulated during the revolutionary period that are not listed in the "Red Book", during the depression of the 1830's ("Hard Times" tokens) and US Civil War. These also circulated as money, though I would not be able to tell you how widely they did so. In many or most instances, that is why they were created, because there was a shortage of coin. Probably, there are others between these periods. Many of these also look like coins though I have not seen very many different types. But mostly for the reasons I gave, these are not considered coins either and in my opinion, correctly so. Ultimately regardless of whether something is classified one way or the other, people will collect it if they like it and will not if they do not. Since the most popular coins, whether actual or not, look VASTLY better than most tokens to most people, they are going to prefer them by a lopsided majority and they are going to sell for VASTLY more money also. Let me start by saying regurgitating the claims of an earlier report (in this case Parson on the Griquatown tokens) hardly makes the new publisher of this information an "expert" on the subject. "Experts" such as C L Engelbrecht (Money in South Africa); Hern (recent books) etc.. hardly ever provide their sources but they all parrot exactly what Parsons claimed (Parson based his "findings" on the backs of irrelevant books quoted as references in his report and makes assumptions which can be clearly shown and have been shown to be WRONG). I would challenge and have challenged Hern on several occasions in the past to provide the proof of the claims he makes in his books regarding the Griquatown token coins. (For the record he still incorrectly claims they are legitimate coins like the ZAR or Union). Like others he has simply refused to do so and hides behind his position in the numismatic establishment. Can you imagine the impact if our forefathers had not been able to challenge the claims of the "flat earth society"? d) this emerging market of collectors are looking for numismatic pieces that actually played a role in THEIR history not "white" history (eg ZAR). I believe that this is the reason S&Co coins are now attracting much higher prices now. The British annexed East Griqualand in 1878. Before then it was a sovereign Griqua state run by a Griqua Raad based at Mount Currie then Kokstad. They issued land titles and collected taxes and held regular government meetings. Their first money under the Griqua government was the S&Co - issued by the Strachan and Co store in 1874 - accepted by Standard Bank when they first opened in Kokstad - accepted by the Raad in payment of land taxes etc - and accepted as money across the region. (The S&Co were accepted in payment of fines at Umzimkulu Magistrates Court even in the early 1900s). Source: Judge Tom Mullins who was earlier a Magistrate in this region and who sold me his collection of S&Co coins he bought from the Umzimkulu Magistrates Office in the late 1930s. When you understand the basic nature of the Griqua Raad in the 1870s you understand that they did not put everything into legislation (ie like the acceptance of the S&Co as their currency) - even their failed Een Pond note is hardly referred to anywhere but in history books (including Engelbrecht). Furthermore Charles Brisley (the secretary of the Griqua Raad) was also a partner in Strachan and Co.
b) the indigenous population saw them as money back then - and so it was regardless of the "legal" status (the stores were the banks backing up their value) if the Griquas used these early copper coins in the Klaarwater district - as the evidence of worn coins shows - they must have been used as money/ tokens/whatever for the exchange of goods or labour. d) this emerging market of collectors are looking for numismatic pieces that actually played a role in THEIR history not "white" history (eg ZAR). I believe that this is the reason S&Co coins are now attracting much higher prices now. again, what evidence do you have for this? You are the expert on S&Co and have kept an eagle eye on the S&Co market. Do you have any figures for me? Are you aware of any sales or purchases of S&Co tokens by the members of our indigenous population group? We have been down this track so many times I am surprised that there is not now a "deep hole" in the ground over this issue! Ask Alex (aljada) who agreed with me many years ago that wear on a coin does not JUST represent circulation. I am sure that many other reputable coin collectors would agree. It can be caused by poor storage; deliberate wearing or a multitude of other reasons. Circulation as "money" was certainly NOT one of the reasons the Griquatown tokens are worn. 1) See my answer above. 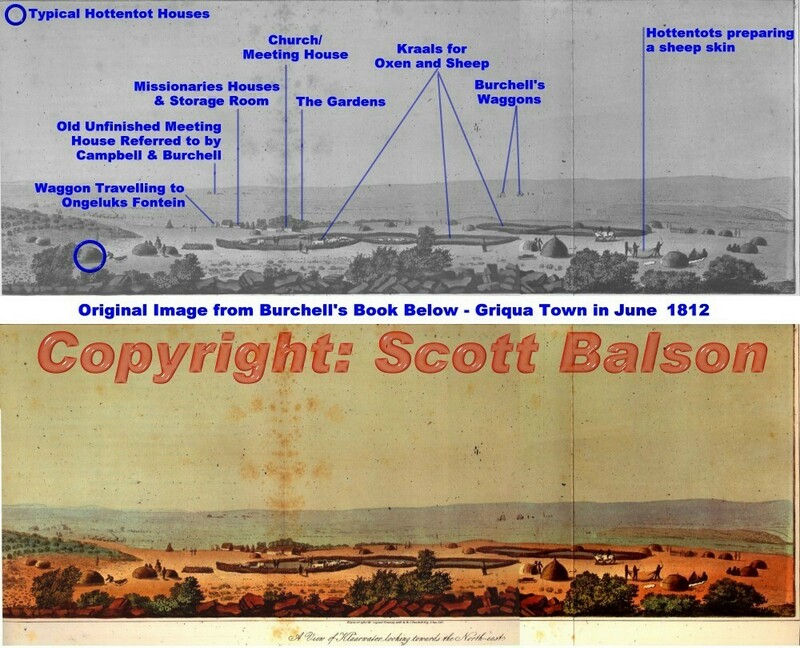 2) Get Burchell's book on "Travels into the interior of South Africa" - he visited Griquatown in 1812... here is a link to his book digitised by Google. I have transcribed key extracts from the book at this link... Read his first hand accounts on the lifestyle of the people who lived at Klaarwater from the extracts. The Google copy does not include the images.. so let me give you a scan of Klaarwater drawn by Burchell in 1812 (which became Griquatown in 1813)... this image speaks for itself. 3) There was NO store in Griquatown until after the 1840s - so where did they circulate amongst a largely nomadic, uneducated people who lived by barter and whose resident chief (Waterboer) clearly refused to accept them in payment for his services? Why then would any of his followers accept them? 4) Why did Campbell state in a documented letter written in 1820 during his second visit that UNLESS a trading store south of the Orange River accepted them they would fail. No trading store ever did. PS There is no and never has been a "Klaarwater district" in or around Griquatown post 1813 - that is a Hern fabrication. I have had many indigenous collectors approach me about buying Strachan coins and, not only that, but I met with the direct descendant of the Chief of Sidoi while I was in Kokstad just a few weeks ago. The indigenous people have a very active interest in their history - perhaps you are NOT engaging them correctly. They are, understandably, very suspicious of dealers who continue to overlook their history.. I think the first coin dealer in South Africa who changed their thinking and embraced and promoted coins that engaged their forefathers would be setting the framework for numismatics in South Africa in the future. Yes I know of many indigenous collectors (even on BoB) who buy Strachan & Co coins. I am not going to be so stupid as to name them here - that would be a blatant breach of their privacy. I am happy to give Cuan details and he could confirm from an independent position. Maybe coin dealers should wake up to where their future market is and how to engage indigenous collectors by reaching out to a history that is relevant to THEM. Take a walk down the streets of Port Shepstone today and see what I mean. 1. I am part of the numismatic community that do still believe 100% that the early GQT coinage did actually circulate in the South African interior pre-1825. My take on it is that it was a failed experiment. 2. As a community, we are using the term "GQT" too loosely. There was the failed distribution of coinage by missionaries in the South African interior prior to 1825, then the GriquaTown patterns which were produced as salesman pieces.Two varieties of the latter were produced; the dated (1890) and undated varieties of the same pattern. 3. The (later) GQT patterns never circulated and, with the date in mind, would seem to me to have been aimed at the Griqua community which had left their ancestral and diamond-rich lands to settle in Kokstad. These patterns were produced by Lauer for emerging peoples in the Transvaal, Orange Free State and Kokstad (as well as for the Cape of Good Hope). 4. Going back to the early GQT coinage experiment, whether there was a use for them or otherwise by the nomadic people at Griquatown and the huge surrounding area is immaterial: the Germans touting their GQT patterns in the late 1880s or 1890 must have receieved a huge shock when finding the Griqua community at Kokstad was relatively poor, had no diamonds, and definitely had no use for their own coinage. 5. You say: "I have had many indigenous collectors approach me about buying Strachan coins and, not only that, but I met with the direct descendant of the Chief of Sidoi while I was in Kokstad just a few weeks ago. The indigenous people have a very active interest in their history - perhaps you are NOT engaging them correctly"
I filled in the recent South African census where the dwellers in a house have to be specifically listed by race, so now I know that our Government considers such race classification to be politically acceptable, let me proceed further on this path. Let me ask you, are you referring to blacks as indigenous collectors? If so, then I am really pleased because this has not been my experiience in the Eastern Cape. 6. With reference to the above, an active interest in one's history does not necessarily translate into a passion to buy historical objects. 7. Please confirm that the "indigenous collectors" that you actually know are active numismatists and that you refer to walking down the streets of Port Shepstone are black - not Indian? 8. I would also love to see our indigenous (black) population more involved in numismatics. Unfortunately, the reality is and my experience has been that this does not seem to be the case in the Eastern Cape. I can only speak from an "outsider" on the issue of engaging indigenous people in their numismatic history - and here I am talking about the Zulu, Xhosa etc.. My experience a few weeks back is that there has become a great divide when it comes to South African history. I went to several museums around South Africa and was appalled by what I saw - for example, if you live in Bloemfontein visit the Presidential House in Brand Street and see how most of the cabinets are now empty... near the entrance just the stands for historic artifacts remain locked in a cabinet; at Kuruman the 2/6 that Robert Moffat carried all his life has been stolen out of a locked cabinet at the Moffat Mission - just the note remains (many other items have disappeared). Both these museums, like most other today, have African curators who clearly have no interest in "white" history. The lady I interviewed at Mary Moffat Museum (Hetta Hager) in the video linked in my opening post for this thread above retired a few weeks ago and her replacement is the coloured cleaner. This is what is happening under your noses - right now! The siege museum at Mafikeng now has a room filled with placards and notice boards about early African history - the siege artifacts including the bank notes are now in a backroom where the lights have not worked for months and (THIS IS TRUE!) you are given a torch so that you can shine it on items in the room which is otherwise pitch black! Engaging the indigenous people in their numismatic history requires a rethink from the white centric side of numismatics - and there is no better way to do that than through early token coins which CLEARLY played an important role in their history in regions like East Griqualand and Kimberley. When one considers the manner in which museums are seen I am not surprised that there is no interest shown in ZAR or Union pieces. I am part of the numismatic community that do still believe 100% that the early GQT coinage did actually circulate in the South African interior pre-1825. My take on it is that it was a failed experiment. Once again I would refer you to Burchell (links in my post above) - Schoeman (The Mission at Griquatown 1801-1821) turn to page 144 and follow the referenced pages listed under "coins". If you read the extracts from original documents and letters from that time you will quickly see that what Parson suggested is simply hocus pocus. His claims are now parroted by Hern. In your quote above you say it was a "failed experiment". In which way did it fail? It clearly was nothing more than a token coin - even the London Missionary Society state that in their correspondence from that time (Hern claims it is a legitimate currency - again based on Parsons flawed assumptions). - the comment by Waterboer in the video above is very telling for ONE important reason - only his grandfather had any of the tokens in Griquatown. When you read the early history of Griquatown you see that Andries Waterboer (a San) was saved and raised by the missionaries. Despite this relationship with the missionaries he, as the community leader, refused to accept these tokens in payment for his services in the school - demanding rijksdaalder (source Schoeman). The five or so tokens he had could well have been an initial attempt by the missionaries to get the coins circulating.. but where? with whom? there were no trading stores. The tokens weight did not match that of any imperial coins.. the trading stores south of the river refused to accept them. The comment by Waterboer in the video that "they kept them" as opposed to circulating them makes perfect sense - the Griqua did not understand money and Waterboer could not see them as anything more than a form of gift or trinket. The importance of Hetta Hager's comment that not one Griqua had ever brought in a Griquatown token should not be overlooked. It is quite clear that the Waterboers had a few in their family but no one else in the community had one. If they had circulated they would have been handed down by other Griqua families who would most certainly over a 30 plus year period have called at the museum to get information. They never did. The manner in which most Griquas live must be a great obstruction to personal piety, continuing to dwell in huts the shape of an inverted teacup, the same as when they lived a wandering life like wild Arabs. The people were not advanced enough at that time to engage in a currency of token coins - they had no understanding of it, rejected it and the experiment clearly failed before it even started. I am amazed that some collectors still present the image of a bustling community with trading stores and these token coins at the core.... the truth is very different (look at Hern's book and that is the picture painted). I am now looking forward to a correction to the date they arrived at Griquatown - ie circa 1820 NOT 1814-15 as Parsons once suggested! But I, for one, won't be holding my breath! Were the items legal tender? As I said before, not all coins were struck by a government or government authorized, but any issue so struck is by default a coin. And those that were not, have the burden of proof and not the other way around. Did the coin's face value have any relation to the value of the metal content? Once again, this is not conclusive one way or the other but in most instances, there is a high correlation. It was not common at all for coins to be worth much less than their face value. You can tell me how it applies to these. Do the items in question look like a token or a coin? There is a reason why most tokens are classified as they are and this is a big one. The S&C look far more like a NYC subway token than any other coin I have seen. That may not matter to you and those few who collect them but it does to most. The appearance of the item absolutely has a huge impact on the difference in popularity and no one can dispute that fact. Did the items circulate as money? Yes, this matters but it is not conclusive either. Patterns and commemoratives are coins and they were not sstruck for circulation. Likewise, tokens may also circulate but this does not make them coins either. In this instance, I will simply take your word for it that they did since you know more about them than I do. As for the financial aspects of this topic, I gave you (and a few others) a wriet-up where I described the attributes which have a high correlation with the popularity and prices of coins. Maybe this is not all of them, but what I wrote is a comprehensive explanation of the most important ones, though others have a difference of opinion of which are more important than I do. The examples I provided and conclusions I made were not based upon my personal preference, but those that appear to be the preferences of most collectors. There are exceptions and outliers but usually, people are going to pay more for large coins, gold over silver and silver over base metal and those which are better preserved, even for coins that are equally scarce. The historical aspects that are apparently most important to you are important generally, but they are usually less important to most than these other factors I listed, especially when many of them apply at once. This is true not just for US coins but seems to be for coins generally from auction prices. In a prior post, I already addressed the more recent 1994 RSA coinage. First, yes I agree that to the extent that Black South Africans decide to become collectors, that this will be an area where they will choose to focus more than current collectors do at this time. But no, I do not believe that most of these coins are going to appreciate substantially for the reasons I already gave. Either the coins are far too common in which case South Africa is likely to follow the US as I described in the thread covering RSA coinage. Or for those which have lower mintages, they are already among the most expensive (and in some instances overpriced) coins in the world. and since they are, any substantial increase from current levels would, depending upon the specific coin, potentially make it more expensive than all but a small number of even the most expensive US coins. The likelihood of that outcome is remote. I hear what you are saying but we have very different philosophies. To me NUMISMATICS - the love of coins and their history - is what drives me. To you it is the profit and investment angle - based on outdated technical criteria. I have to say that I am surprised that Wall Street have not yet devised an ETF on Americas top 100 most "valuable" numismatic items... maybe they have. In my view legalised gambling has totally destroyed the integrity of sport - like the current rugby union world cup so why not add a Wall Street gambling slant on global hobbies? (BTW I believe S Africa should have won - and that we had a key player backing an Australian loss but nothing beats the man who blows the whistle). My perspective and interest has always been and always will be the HISTORY behind coins - that is the point I was trying to make to Mike in my post above. Would a South African coin collector be tempted to start collecting Chinese coins? I doubt it. For potential indigenous collectors the chasm between the ZAR and the early trading tokens used by the forefathers of South Africa's new empire builders is wider than the Pacific Ocean. That is why hundreds of worthless Mandelas are being slabbed - a misdirection of interest and history. The dealer who educates the indigenous collector on the key role trade tokens played in THEIR history will be the one who embraces this emerging market of collectors. I think you made the point that South Africa is a small market as far as US collectors are concerned so, perhaps, the attention of serious collectors in South Africa should be aimed more at indigenous history where a whole new field of financially empowered indigenous people live and buy Porsches day by day...l was passed by quite a few when I travelled across the country from JHBG to Griquatown, Philippolis to Bloem, CT to Kokstad, Durban to the KNP in my rented "wheelbarrow"!! - as to whether they were tokens or coins is a sticking point between us. In an age when coins were used on the basis of the precious metal content and not face value, it is curious that the silver ten "pence" issues had almost double the high quality silver content of the five "pence" issues. if the intention was to use them as tokens, why go to the unnecessary expense of using silver? - the crowning argument to my mind is that there are far too many fine copper pieces in existence that display not just wear and tear but extremely heavy wear and tear - mirroring that found in very old farthings, halfpennies and pennies. It is inconceiveable to me that these worn GQT copper pieces arrived in that condition due to "poor storage over many, many years". In fact, even the poorest of storage will result in a coin remaining in perfect condition, apart from possible surface deterioration which will not affect the mass at all. What we have seen in South Africa is the presence of copper GQT coins with the heavy wear and tear that is absolutely consistent with hand to hand circulation over a long period of time. Lastly, I am shocked - but not surprised - by your observations on some of our South African museums. May I quote your comments in order that I might at least try to get something done about this? * the shilling weighed about 6.0 g and had a diameter of 25-26 mm; after 1816 the weight was reduced to 5.47 g and the diameter to 24 mm. The GQT 10 "pence" (Hern) weighed 4.9 g - but of a higher quality silver - and had a diameter of 25.9mm (Hern). * "The French Revolutionary Wars from 1792 to 1799, and the Napoleonic Wars from 1799 to 1815 led to financial instability in Britain. The shortage of silver and copper led to a shortage of coins." Wikepedia. * enormous quantities of shillings and sixpences were minted in Great Britain between 1816 and 1820. The mintages were almost 40 million for the shilling and 21 million for the sixpence. When you compare the British sixpences and shillings with the 5 and 10 GQT "pence", the two lots are remarkably similar in size and weight. Lastly, given the explosion in mintage of sixpences and shillings which occurred after 1816, it is exciting to see at last perhaps why these GQT silver pieces were minted and why they are referred to as having being produced between 1814 and 1816: there was a huge shortage of silver coins of these denominations prior to 1816. Given the time it took to mint these GQT coins and then for them to reach the Cape and thereafter into the interior, one could speculate that they reached their target at, unfortunately, the same time period as a veritable flood of similar-sized and denominated coinage. This rendered the silver GQT coinage almost immediately obsolete. Given the time it took to mint these GQT coins and then for them to reach the Cape and thereafter into the interior, one could speculate that they reached their target at, unfortunately, the same time period as a veritable flood of similar-sized and denominated coinage. This rendered the silver GQT coinage immediately obsolete. Fascinating hypothesis! Am interested in not only Scott's response but that from others too. Must say that as a non token-collector this is rather intriguing all round. BTW Margaret Neethling has just retired as Curator of the Port Shepstone Museum - I met with her early October. She is most concerned about what is going on there - two unqualified indigenous women now run this museum. If they circulated could you suggest where and when? I would be interested in your views because the evidence was it wasn't Griquatown. See my post below where I state that, if they circulated, then they probably circulated in an illegal English gambling den back in the 1800s. That is interesting but if you look at your post all your sources talk about the physical properties of the GQT tokens and in no way mention how they come to the conclusion that they circulated at certain times in Griquatown. Here is a complete scan of Parsons 7 page paper: Parson's "The coinage of Griqualand"
Note that just three unrelated contemporary references are used in the entire document (ie apart from the two other earlier publishers on the GQT who he disagrees with)... NONE of his references are relevant to the coins actually circulating or when they were sent to Griquatown. (Parsons three references: Moffat - book published 1846 - never mentions the GQT); Livingstone - who only came to S Africa in the 1840s never mentions GQT!!! and Campbells first trip where he says if a store was established they could be considered - in his book on his second trip HE FAILS TO MENTION the GQT tokens. In private letters from that second 1820 trip Campbell states that they were not accepted by the Griqua and would not be UNLESS a trading store could be found to accept them. He never got one to accept them). In my view Parsons document is a complete fraud - making all the references to the GQT in which publishers use Parsons since no better UNLESS they can support their claims with evidence of facts claimed. All I can tell you with complete conviction is that IF these GQT tokens circulated it WASN'T at Griquatown and it wasn't among the Griqua and it is highly unlikely that they arrived before 1820. If they did indeed circulate it was as chips in the 1800s at some illegal gambling house back in England. Very few have originated from South Africa - the ones that Waterboer refers to.. the rest? My "bet" is that if they "circulated" it was as gambling chips far away from Griquatown. (For the record I have played poker using old commemorative medallions as chips at a farm near Ixopo - when i was in my early 20s). The basic errors in the Parsons document has always been the basis of and remains my argument. The books written at this time continue to refer to Rijksdaalder being the only form of currency in use at Griquatown in the early 1800s. Its isolation was one of the reasons the failed GQT tokens were sent there. The Griqua lived in community groups and only bartered between established family groups - this was always by way of skins for meat etc... the only time they use "European" money was to buy brandy, guns and powder etc.. when travelling south and meeting settlers. There was no place for a token coin as there was no trading store in the Griquatown region. Thanks for the clarifications Scott! We are talking about a failed event that took place almost 200 years ago, so to find direct references to the GQT coinage is rather like trying to find a black hole in space, which cannot be done except by looking at the effect a black hole has on stars in the neighbourhood. In the early 19th century the new colony of Australia was in a similar situation to Britain and her other colonies and in late 1812 Spanish dollars were used to produce holey dollars and dumps, which were gradually withdrawn from 1822 (Wikepedia). Question - and I really do not know the answer - are there contemporary written accounts to how many holey dollars it took to buy a cow, or how many dumps were paid for some bushels of corn? Yes, I have referred to the physical characteristics of the 2 silver GQT coins because, like a black hole, it is important to work out why they were minted as they were. As they were roughly the same weight, the same size and displayed the reeded edges of the British shilling and sixpence, surely it is fair to conclude that these two GQT coins were intended to be equivalent in value to these two British coins? And...the only purpose of a reeded edge is to make sure that slivers of valuable silver are not cut off to debase the value of the coin because at that time the actual value of a coin was based on its precious metal content, not on what was displayed on its face. The precious metal content of coins made them useable right throughout the world, with the bearers of silver and gold coins knowing the equivalence of a Spanish dollar compared to guineas, ducatoons, escudos, etc. * the uprisings of the Spanish South American colonies and their subsequent independence from Spain in the early 1800s severed the torrential flow of "free" silver from the New World to Spain and, in turn, from Spain to the rest of Europe. This had a catastrophic effect on European trade with the east and with China in particular as the Chinese would only accept silver (by weight) for their exports. * because of the reduced availability of silver from South America, the value of silver in the Old World soared and the availability of silver decreased as whatever silver remained was put on ships to the east to maintain some semblance of the China trade. *The British occupied the Cape in 1795. To alleviate a critical shortage of coins, they introduced coins from St. Salvador and St. Helena. Amongst these coins were half Johannas, Spanish dollars, ducats, sequins, mohurs, guilders, shillings and copper pennies. As soon as these coins were circulated they disappeared - in all likelihood melted down or taken away by visiting sailors. As an emergency measure, a shipment of captured Spanish dollars was over stamped with a small punch bearing the bust of George III on the neck of the Spanish King! (SA Mint website). * silver coins to the value of 1, ½, ¼, 1/8 and 1/10 guilders and 1 and ½ doits in copper, which had been minted in the Netherlands in 1802, were used in the Cape. These coins, first known as Cape Guilders, and later, on the strength of a design of a ship on the obverse, as Ship Guilders, may be regarded as the first coins in a South African currency. (SA Mint website). * When The British occupied the Cape for the second time in 1806 the acting Governor, Major General Baird, immediately issued a proclamation to establish the relative values of all coins in circulation in the Cape. He also placed all coins minted for the Batavian Republic, and still in storage, into circulation. On 6 June 1825, Sir Charles Somerset issued a proclamation that only British Sterling would be legal tender in the Cape. Despite this, the Rix Daller was still used for many years in the Cape. The troops continued to be paid in Spanish dollars, which held their place as a universally acceptable currency (SA Mint website). What we have above shows the world in the early nineteenth century in financial turmoil. The Old World (Europe) had an insatiable appetite for goods from the east, but the means to acquire these eastern products was choked by events in Spanish America and the loss of the essentially free silver therefrom. (Incidentally, only a few decades later the British forced the Chinese to accept opium for their exports after victory in the Opium War). South Africa was similarly affected, so maybe it wasn't such a bad idea for the parsimonious London Missionary Society to allow the Rev Anderson to have coins minted for useage as it extended its tendrils into the interior of South Africa? Re what he found in this interior, it is true that the site of Griquatown itself was sparsely inhabited, but the party of 1000 men from this interior who were killed in 1840 whilst attempting to steal cattle from Mzilikazi shows that there was a fairly large but dispersed population in this interior. Lastly, I do not think the worn GQT coinage was worn due to gaming: I have actually seen a very old hoard of coins which all pre-dated 1820 and included a GQT silver 10 pence! And......the many worn copper GQT coins I have noted have been found in South Africa itself, not overseas. Like the presence of a black hole, there are just too many things which point to the GQT coinage as having been in circulation. Not for any length of time and certainly not successfully - but they were in useage in South Africa.